LOCATION.--Lat 40°55'04.0", long 72°38'19.2" referenced to North American Datum of 1983, Suffolk County, NY, Hydrologic Unit 02030202, at County Road 105 bridge, in Riverhead. PERIOD OF RECORD.--August 2012 to current year. GAGE.--Water-stage recorder. Datum of gage is NGVD of 1929. REMARKS.--ELEVATION WY 2014: Records good, except those for Nov. 8 to June 27, Aug. 18-19, Sept. 6-13, which are fair, and Sept. 14-30, which are poor. Satellite elevation telemeter at station. EXTREMES FOR PERIOD OF RECORD.--Maximum elevation, 8.56 ft, Oct. 29, 2012; minimum elevation, -3.22 ft, Jan. 20, 2016. EXTREMES OUTSIDE PERIOD OF RECORD.--Storm tide of Dec. 11, 1992, reached an elevation of 8.2 ft, from high-water mark at site 1.7 mi northeast. PERIOD OF RECORD1.--August 2012 to current year. Sampling depth records for August 2012 to current year are unpublished and available in files of the Geological Survey. PERIOD OF DAILY RECORD1.-- WATER TEMPERATURE: August 2012 to current year. SALINITY: August 2012 to current year. DISSOLVED OXYGEN: August 2012 to current year. TURBIDITY: August 2012 to current year. CHLOROPHYLL: August 2012 to current year. NITRATE: August 2012 to current year. 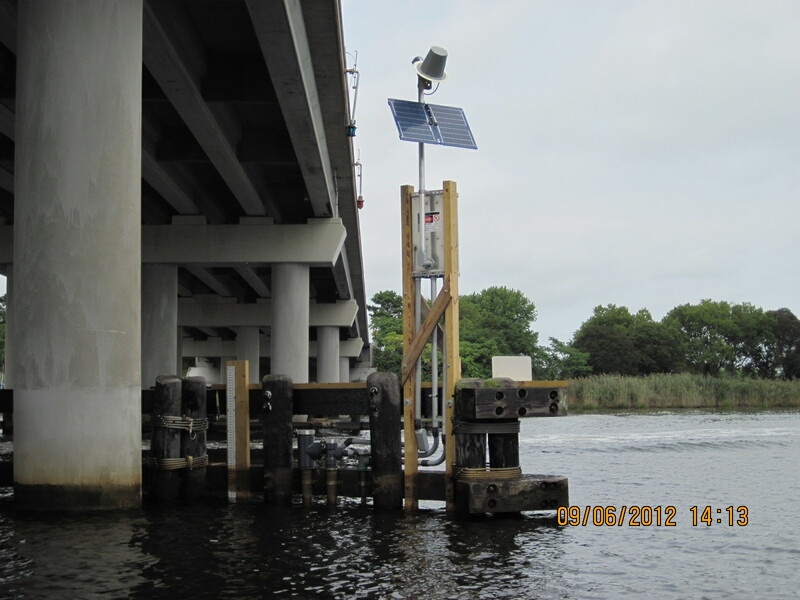 INSTRUMENTATION1.--Water-quality monitor provides 6-minute-interval readings collected from 1.6 ft above bottom. Nitrate analyzer provides 30-minute-interval readings collected from 1.6 ft above bottom. Salinity record computed from specific-conductance readings. REMARKS1.--Satellite telemeter for water temperature, specific conductance, dissolved oxygen, pH, turbidity, chlorophyll, nitrate, and sampling depth parameters at station. Interruptions of record were due to the malfunction of water-quality monitors or sensors. WATER TEMPERATURE WY 2016: Records excellent. SALINITY WY 2016: Records excellent. DISSOLVED OXYGEN WY 2016: Records excellent, except those for Oct. 2-13, Oct. 31 to Nov. 24, Dec. 18 to Jan. 8, Jan. 17-25, Feb. 6, May 2-20, June 4-19, Aug. 9, 11, 17-20, Sept. 12-16, 18, 21-30, which are good, Jan. 26 to Feb. 5, June 20-25, July 1, Aug. 22-27, Sept. 1-2, which are fair, Feb. 7-14, June 26-30, July 2-11, 13-14, Aug. 28-31, Sept. 3-9, which are poor, and Feb. 15-25, July 12 which were deleted. CHLOROPHYLL WY 2016: Records excellent, except those for May 12 to June 1, June 4, 17-19, 21-22, Sept. 16-22 which are good, June 2-3, 5-13, 20, 24-25, 27, July 11, Sept. 23-29, which are fair, June 23, 26, 28-30, July 12-14, Sept. 30 which are poor, and July 1-2 which were deleted. NITRATE WY 2016: Records excellent, except those for Oct. 1, 6, 9, May 4, 9-12, 14-15, 17, 20, June 1-2, July 17-18, 26-29, Aug. 28 to Sept. 1, which are good. Oct. 2-5, 7-8, 10, May 13, 16, 18-19, June 3-6, 10, July 30 to Aug 3, Aug. 5-6, 8, Sept.2-7, 9, which are fair, June 7-9, 11, Aug. 4, 7, 9-11, Sept. 8, which are poor, and Aug. 12 which was deleted. EXTREMES FOR PERIOD OF RECORD1.--WATER TEMPERATURE: Maximum, 30.4 Â°C, July 18, 19, and 20, 2013; minimum, -1.3 Â°C, Feb. 10, 2013. SALINITY: Maximum, 29 psu, Jan. 25, 2016; minimum, 15 psu, Feb. 25, 2016. DISSOLVED OXYGEN: Maximum, 16.5 mg/L, Mar. 13, 2015; minimum, 0.1 mg/L, May 28 to June 4 2015. TURBIDITY: Maximum, 630 FNU, Oct. 14, 2013; minimum, <0.1 FNU, many times throughout the year. CHLOROPHYLL: Maximum, 500 ug/L, Sept. 29, 2012; minimum, <0.1 ug/L, Feb. 22, 2013. NITRATE: Maximum, 1.4 mg/L, May 15, 2015, minimum, <0.01 mg/L, many times throughout the year. Elevation observations and tidal predictions for this station are reported to NGVD 1929. To convert data to NAVD 1988 subtract 0.95 ft. To convert data to MHHW datum subtract 2.20 ft. To convert data to MLLW datum add 1.13 ft. These corrections vary from site to site. Add up to 2 more sites and replot for "Sampling depth, feet, monitor"
Add up to 2 more sites and replot for "Temperature, water, degrees Celsius, monitor"
Add up to 2 more sites and replot for "Specific conductance, water, unfiltered, microsiemens per centimeter at 25 degrees Celsius, monitor"
Add up to 2 more sites and replot for "Dissolved oxygen, water, unfiltered, milligrams per liter, monitor"
Add up to 2 more sites and replot for "pH, water, unfiltered, field, standard units, monitor"
Add up to 2 more sites and replot for "Chlorophyll, total, water, fluorometric, 650-700 nanometers, in situ sensor, micrograms per liter, monitor"
Add up to 2 more sites and replot for "Estuary or ocean water surface elevation above NGVD 1929, feet"
Add up to 2 more sites and replot for "Estuary or ocean water surface elevation above NGVD 1929, feet, tidal prediction"
Add up to 2 more sites and replot for "Estuary or ocean water surface elevation above NAVD 1988, feet, NAVD88"
Add up to 2 more sites and replot for "Estuary or ocean water surface elevation above NAVD 1988, feet, tidal prediction, NAVD88"
Add up to 2 more sites and replot for "Turbidity, water, unfiltered, monochrome near infra-red LED light, 780-900 nm, detection angle 90 +-2.5 degrees, formazin nephelometric units (FNU), monitor"
Add up to 2 more sites and replot for "Salinity, water, unfiltered, practical salinity units at 25 degrees Celsius, monitor"
Add up to 2 more sites and replot for "Difference between observed and predicted water surface elevation, feet"